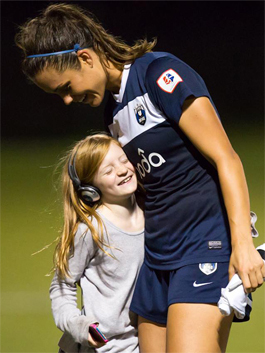 The Seattle Reign FC has competed at the highest level of women's professional soccer in the United States, excelling in the National Women's Soccer League while showcasing local stars and international icons. Reign FC finished the 2014 season with an almost perfect sheet before falling in the league championship game. Kim Little received the league’s Most Valuable Player and Golden Boot awards for her outstanding offensive prowess, while Head Coach Laura Harvey was also recognized as the league’s Coach of the Year. Washington Youth Soccer has grown into the state's largest youth sports organization, and is currently one of the largest youth soccer organizations in the United States. It has also been one of the most successful, providing the necessary tools for players, families, and coaches to prepare youth players and coaches for recreational, competitive, collegiate, professional, and National Team careers, while providing a safe, supportive environment for the over 100,000 families statewide enjoying the many benefits the game of soccer offers. Beginning in 2015, the Seattle Reign and Washington Youth Soccer will work together to further grow the game of soccer in Washington state by offering ticket discount sales to membership, State Cup player appearances, camps, and coaching education. Washington Youth Soccer believes the benefit of a partnership with the Seattle Reign FC is one which is far reaching to all levels of the game within the state’s soccer community. The two organizations are thrilled to announce a partnership as a benefit to the many soccer enthusiasts and families within Washington Youth Soccer. "We are really excited to be partnering with WA Youth Soccer, and we feel this is a huge thing for our club to show how important grass roots soccer is in our state," says Laura Harvey, Reign FC Head Coach. "We want to be able to show every young player that there is an opportunity to play the sport at the highest level and also be able to give back to the local community by sharing some of our experiences and expertise." "Washington Youth Soccer is excited to partner with the Seattle Reign FC to promote and share the top of the women's competitive professional soccer game with our membership," says Kimberly Calkins, Washington Youth Soccer's Director of Programs. "Not only is Reign FC our local women's professional team, they are one of the top clubs in the world. On any given game day, families can watch the best women's national team players from around the world in one venue. The games are exciting, with the creative likes of a Kim Little and Megan Rapinoe. "It gives young girls something to shoot for, fans from a great soccer city something more to cheer for, and a game so beautifully played it will leave fans of all gender and ages in awe," Calkins continued. "The Washington Youth Soccer community will benefit from access to special training sessions, players appearances, single game ticket offers, and the coaching expertise from one of the most respected coaches right now in the women's game, Seattle Reign FC's Laura Harvey. Laura will partner and advise the coaches in our state; this is an incredible benefit and one we cannot wait to share with the rest of Washington -- to elevate the understanding, knowledge, and overall soccer IQ in our state." Regular-season games begin Apr. 12, with the Reign hosting the Western NY Flash at Memorial Stadium's Moda Pitch at 4 p.m. PT (purchase tickets below). To view the complete Reign schedule, visit ReignFC.com. As a WA Youth Soccer member, you have the opportunity to purchase discounted tickets to the Reign FC vs Western NY Flash home opener on Sunday, April 12, at 4:00 PM at Memorial Stadium. Buy your tickets today with the promo code wayouth412! If there any questions, please contact the Reign FC box office at 855-REIGN-FC.